An evil, sadistic Leprechaun goes on a killing rampage in search of his beloved pot of gold. When You Think of Little People in the Movies? On his one thousandth birthday, an evil leprechaun selects the descendant of one of his slaves to have as his bride, leaving it up to the girl's boyfriend to save her. An evil leprechaun finds himself in Las Vegas, where he proceeds to cause mischief by killing people, granting twisted wishes, and infecting a young man with his green blood. Our deadly leprechaun is in space to woo a beautiful princess who is impressed with his gold and desires to separate him from it. When Emily Woodrow and her friends happen on a treasure chest full of gold coins, they fail to to heed the warnings of a wise old psychic who had foretold that they would encounter trouble with a very nasty and protective Leprechaun. Two young couples backpacking through Ireland discover that one of Ireland's most famous legends is a terrifying reality. The evil Djinn is awakened once more, and must collect 1001 souls to begin the Apocalypse. Leprechaun: [the Leprechaun talks to himself while sitting over his pot of gold] Ah! Try as they will, and try as they might, who steals me gold won't live through the night. Q: Who dies in the movie? Q: Why was the leprechaun obsessed with shining shoes? Q: What happened to Tory's father? Horror movie, not short on laughs! 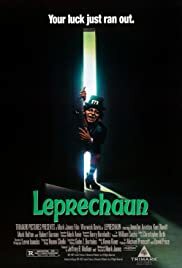 Other members of the IMDb may have rated this "1", and that's up to them, but I thought Leprechaun was a real fun horror movie. I have seen the other films in this series but the first was entertaining. Low on budget yes, but never boring and always whimsical. Warwick Davis, the small actor who plays the leprechaun, is very good in this role, as he is in all his movies. He may be lacking in height but not talent. A brilliant performance by him, and even Jennifer Aniston isn't that bad, and I usually find her a turn off in movies. Humour, horror, and lots of pace. I gave it 7 out of 10.